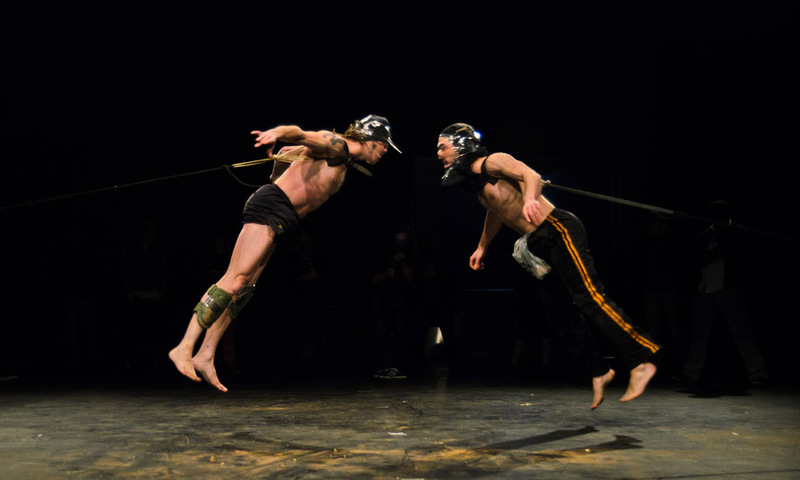 Whelping Box is a place to test the body, the performer, and the spectator. It is a place of permission, of what we allow of each other. A breeding ground for wild things, for dogs and gods. Two performers chain themselves to stakes, to test their limits and strip themselves of civility. With ritual, endurance, dancing and fighting they construct a self-made mythology. They are your guides, guinea pigs and preachers. They feed on your energy in a series of tasks that form a darkly humorous attempt to transcend the confines of normality. With the spectators seated around the action inside a 9 x 9 metre wooden box, nothing escapes the eye. Glorified acts of machismo, strange rituals and power games put on display our most primal desires. An absurd spectacle, carried off with absolute conviction. Presented by Carriageworks, Performance Space and Branch Nebula.